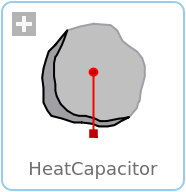 This is a generic model for the heat capacity of a material. No specific geometry is assumed beyond a total volume with uniform temperature for the entire volume. Furthermore, it is assumed that the heat capacity is constant (independent of temperature). The temperature T [Kelvin] of this component is a state. A default of T = 25 degree Celsius (= SIunits.Conversions.from_degC(25)) is used as start value for initialization. This usually means that at start of integration the temperature of this component is 25 degrees Celsius. You may, of course, define a different temperature as start value for initialization. Alternatively, it is possible to set parameter steadyStateStart to true. In this case the additional equation 'der(T) = 0' is used during initialization, i.e., the temperature T is computed in such a way that the component starts in steady state. This is useful in cases, where one would like to start simulation in a suitable operating point without being forced to integrate for a long time to arrive at this point. Note, that parameter steadyStateStart is not available in the parameter menu of the simulation window, because its value is utilized during translation to generate quite different equations depending on its setting. Therefore, the value of this parameter can only be changed before translating the model.